This pond and its link to the West Branch of the Westport River are the primary reasons for Adamsville's existence. These natural resources created an ideal spot for both a gristmill and a sawmill. Early settlers were quick to realize the area’s potential and dammed the pond to maximize its waterpower. Mills were essential to survival and villages grew up around them. Colonists needed their grain ground into meal and lumber to build their homes. 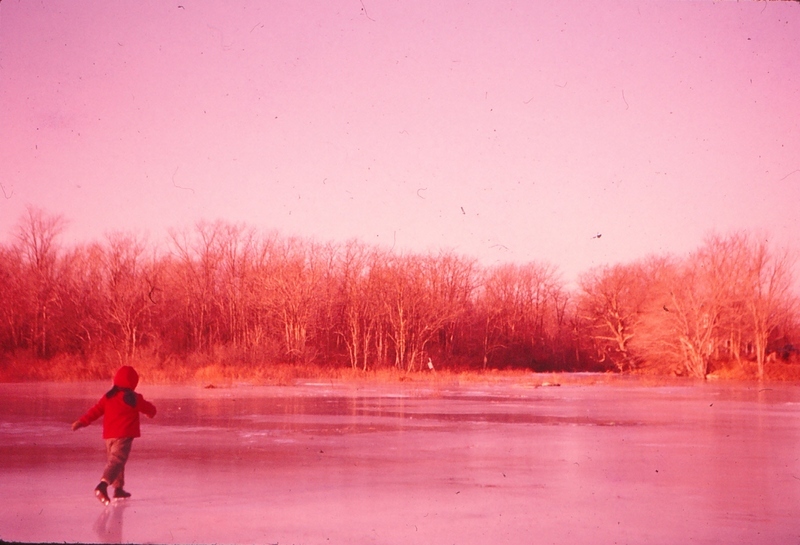 Over the years the pond has also provided the community with both the ice to preserve their food before the advent of refrigerators and a wintertime recreation area perfect for skating. Harvesting pond ice was big business from the 1800s to mid-1900s, although skaters were very unhappy when ice harvesting interrupted their wintertime fun on the pond. Many village men and boys would take part in ice harvesting to earn extra money. They would store the ice in numerous ice houses around the pond, where, packed in layers of straw, it would last all summer. The ice was moved to the ice houses on the far side of the road via a chute that blocked traffic. Vehicles could be detoured along an old road in back of the ice houses (now an office building) called “Ice Avenue,” and parts of this road are still visible today. A recent pond clean-up led by owner Ralph Guild was a major two-state project that returned herring to the pond and preserved wildlife habitats. Adamsville Dam : Looking across the dam that creates and maintains the Adamsville millpond, the village of Adamsville is visible on the far side of the water. Adamsville Millpond : This photograph provides another angle of the Adamsville Mill pond. 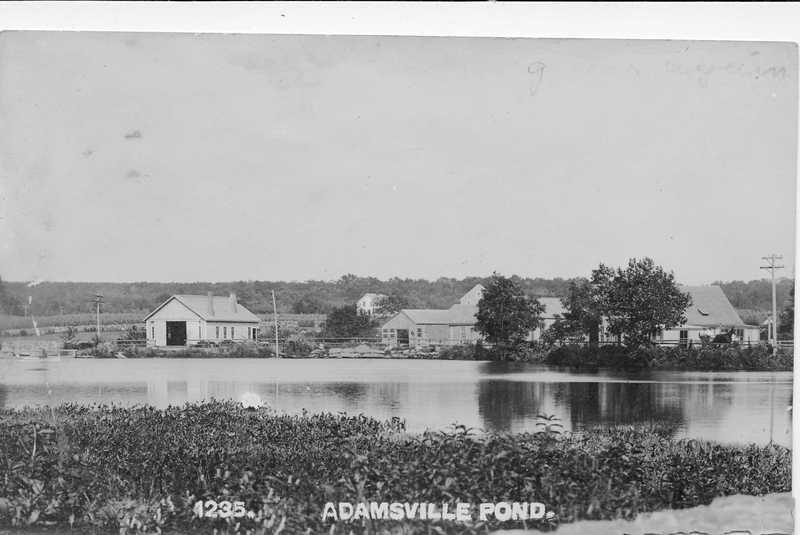 The pond has played a crucial role in Adamsville's history. 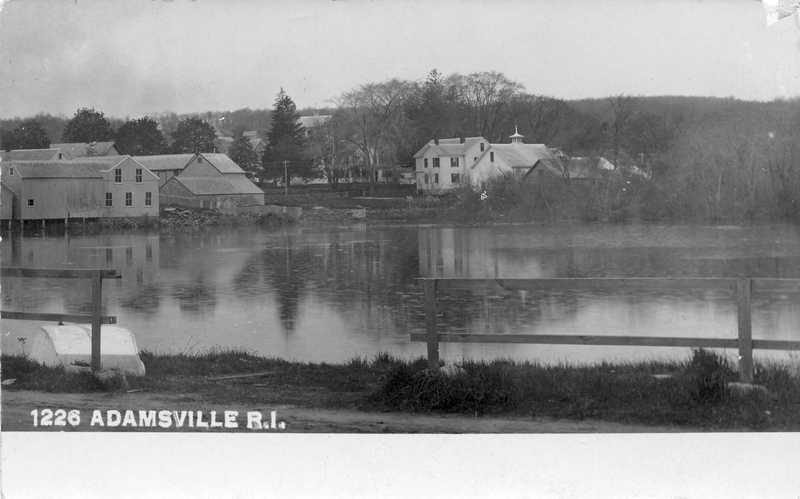 Adamsville Road : Adamsville Road runs along the south side of millpond, where, with changes to the the Rhode Island-Massachusetts border in 1747, parts of the pond became juxtaposed between the two states. 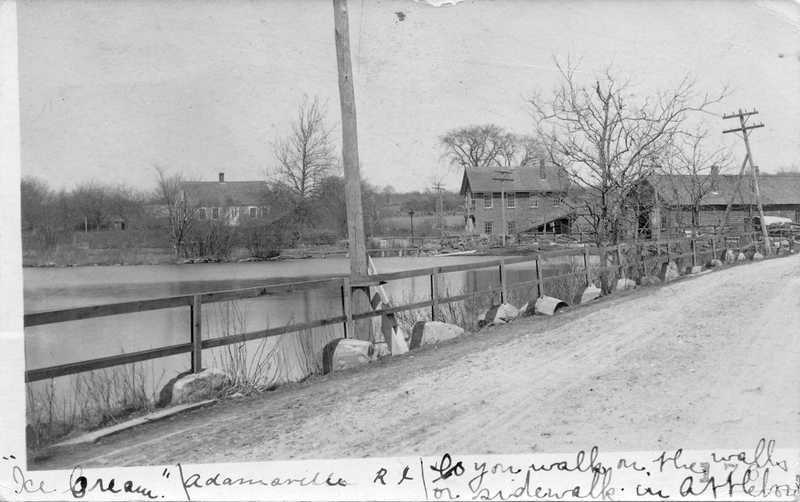 Skating on the Adamsville Pond : Skating was a popular pastime with Adamsville residents, who enjoyed using the millpond as a skating rink. Wintertime fun on the pond was always complicated by the fact that, for many years, ice was regularly harvested from the pond. 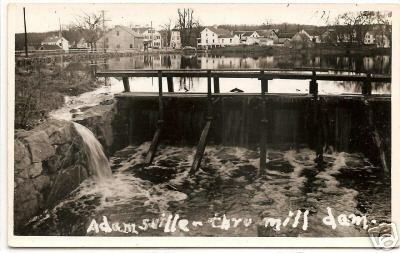 , “Adamsville Mill Pond,” Rhode Tour, accessed April 21, 2019, http://rhodetour.org/items/show/123.